Please see the attached notice for four cut blocks at Twin One Creek, which have been reviewed and approved by Liĺwat Nation pursuant to our Lilwat Nation Land Use Referral Constulation Policy. Liĺwat Forest Ventures engineered the cut blocks and the Land and Resources Department have completed archaeological assessments. 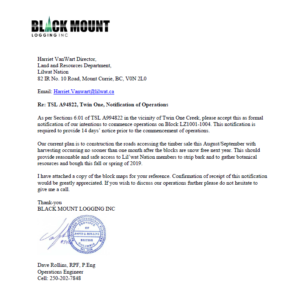 Blackmount Logging will be proceeding with the harvesting and has provided the attached notice for road construction work to begin in August and September, 2018, and logging to be carried out no sooner than one month after the blocks are snow free next year. This is to provide reasonable and safe access to the Liĺwat Nation members to strip bark and gather botanical resources during this fall, or in the spring of next year prior to the forest harvest.